I'm still in recovery mode, but I'm doing a LOT better this week than last. Thank you for thinking of me, because I know you all were. :0 This week was one of transition for me, heading back to work and getting into a daily routine. I have also been pondering themes for the new year and how I want to shape things from here on out. And so, how did we do? -1- *blank stare* "Um, what happened to...YOUR FACE?!" My jaw is finally healing. I've been applying a special, natural cream obsessively like gangbusters, as well as other natural implements (see the bottom of Tuesday's post re: my husband and children living in a salad-like environment) and the bruising is really fading. The broken capillary situation still makes it appear like my face broke out a bit in that area, which is unfortunate, but beggars can't be choosers. I'm just grateful people no longer gasp when they see me. I think the moral of this story is that I need to work on my vanity, because clearly I have some. -2- "Excuse me, are you the librarian?" "Why yes!!" "Oh good." *expectant pause* "Where are the restrooms?" So, the face situation is improving, but I'm finding that it's been difficult to adjust to going to work again. I'm not such a happy camper come 6 am, and I've been rushing in the mornings, which I HATE. But this has definitely been a week in which I feel very "out of sorts," especially at work. I don't like to feel out of sorts, I'm too Type A for this, gentle reader. Now that I have tenure, I rather feel very "where am I going?" I'm very goal oriented. I have met a major career goal, so what does this mean now? As I've been doing the readings and prayers for my Marian consecration this year (via the book Totus Tuus: A Consecration to Jesus Through Mary with Blessed John Paul II, I highly recommend it), I've been really reflecting on how my job is truly an important ministry, in the same way that many jobs are in the way I'm about to describe. People who are asking for help are vulnerable, we've all been there, and a kind response can make all the difference in their endeavor and in their day. That makes me feel a lot better. And thus work is still very disjointed right now in terms of what I will be doing over the course of the next few years. I don't feel very creative at work right now, I feel very "tasky." Personally though, my creativity is hitting a nice stride. I love that I have this blog. 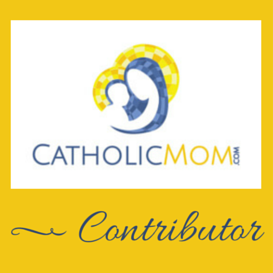 I have always been a regular blogger, right from when I started this baby up. :) I aim to post 5 days per week, but many weeks I can do only 3 or 4 posts. However, that is still plenty of content for a week, and it's a joy to do. It's a wonderful way for me to analyze and reflect on things happening in my life, and I love writing humorous material for the enjoyment of others. I feel *fulfilled* by the writing I do here. I don't get any notoriety or money for it, but that has never been my goal. I like writing, and people read my writing. That means so much to me. This makes your Catholic Librarian very HAPPY. -4- *Somebody* actually likes me!! -5- "Honey, I think the scale is broken again!! That's the *only* explanation for why I keep gaining and losing the same 2 lbs!!" I like to walk, but making time for that isn't always easy with the kids and my job. I have been prioritizing it again of late, but some days it simply isn't possible. And so, I have come up with a new alternative plan for those days that I'm quite pleased with. I'm not a gym person, and plus I'm exhausted in the evenings after I get home from work. Exercise is the last thing I want to do. But I always love to dance, and dancing is about much more than burning calories to me. It's also about creativity. So, on the days that I can't walk, I put Anne to bed and for 15-20 minutes I dance. I put one of my belly dance playlists on shuffle (I have pop music, classic, drum, Saidi, slower rhythms that work with veil, general instrumental that doesn't fit into another category, I AM INSANE) and just improvise to whatever comes on. I did this last night, and it was *fabulous*. Not only does it get my heart rate up for that spell of time, it is FUN, and it allows me to work on my improvising abilities. Speaking of which, for the first time, I watched a video of myself dancing solo. It took a lot of courage, I really think I deserve a medal for this. And I needed a drink afterward, but it actually wasn't as bad as I feared. :0 The fact that I even dance solo now is quite a miracle, let me tell you. It wasn't bad! I did see some things that I can improve on (I saw that many of my movements were smaller because I was nervous, I like to be in control, what can I say), and it was an excellent learning opportunity. Happy! I now need to figure out a way to create a file for my family and friends. I am a bit technology impaired in such matters. In another resolution, I am going to stop just *talking about* doing things I've always wanted to do, and actually do them. The open house for Henry's Catholic school is on Sunday, and I have volunteered. We had an outstanding experience at the open house when we were looking at the school for Henry, and with Catholic schools closing in our area due to lack of enrollment, I really want to help out. So I'm signed up for Sunday with absolutely no idea what I'll be doing, but I'm resourceful. Hopefully I won't embarrass myself, that's always the goal. I'll report in on Monday! All right, back to work! 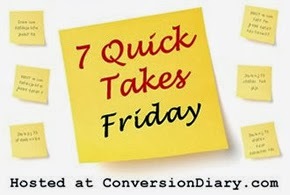 Head over to Conversion Diary for more 7 Quick Takes! I'm so glad you're continuing to recover! Thank you! And yes, it's a terrifying thing, is it not? I had to watch from between my fingers.